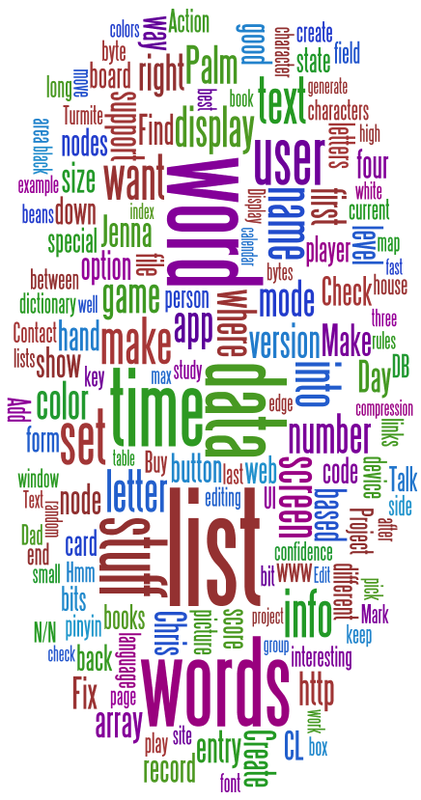 A friend recently pointed me to Wordle, which is a cool little applet for creating interesting tag clouds – not the usual ones that just alter font size, but funky clouds with rotated text, multiple colors, pick-your-font, etc. I recently used Vimeo to publish a video, and it worked well. But I ran into a problem with using the HTML they generate for embedding the video – it’s not valid XHTML. The first problem is that strict XHTML doesn’t let you put this directly into a <body> element – you need to wrap it with <p> … </p> tags. The second problem is that <embed> isn’t a valid XHTML element. Luckily Bernie Zimmermann had a blog post about a similar issue with YouTube videos, so I could apply similar munging. Move the type=”yyy” attribute from the <embed> element to the outer <object> element. Move the src=”yyy” attribute from the <embed> element to the outer <object> element, and change it to be data=”yyy”. This was a Groucho Marx quote I located on Brainy Quote. I thought of it while trying to find a time to meet up with two friends. I hope to have a semi-regular gathering of entrepreneurs in the Grass Valley/Nevada City area, and today was the magic alignment of planets – I’d just returned from Japan, Phil would be back from LA, and Lou was available – but then Phil’s trip got extended. Since one of the universal constants of doing a start-up is that you don’t have enough time to do half of everything that needs doing, I’m not surprised that we’re having trouble getting together. Which makes me think that if you have time to meet, you’re not really an entrepreneur. You are currently browsing the Ken's Techno Tidbits blog archives for June, 2008.